Astronomers have found a bloated, massive galaxy that may be a record-breaker: the most massive galaxy in the near Universe. The mass isn’t exactly clear, but it may be 13 trillion times the mass of the Sun! * That’s easily twenty times the mass of the Milky Way! OOoo, purty. Click to record-breakingly-massively embiggen. That’s an image from the 8-meter Gemini South telescope in Chile, and it shows the cluster Abell 3827, a 1.4 billion-light-year-distant collection of hundreds of galaxies all bound together by their own gravity. It’s a pretty rich cluster as they go. Many like it have one big galaxy in the core, called the central dominant galaxy (or sometimes cD for short), and it’s usually a few times bigger than any other galaxy in the cluster. In the case of Abell 3827, though, the cD — called ESO 146-IG 005 — is out of control. The Milky Way is considered a big galaxy, and has maybe 400 billion times the mass of the Sun in total, but 146-IG is hugely bigger, swollen and ginormous. It’s far more massive than any other galaxy we’ve seen out to that distance. That glow you see in the center of the cluster is just from 146-IG all by its lone self, and it dominates the entire core of the cluster. So how do we know this, and how did it get so big? How it got this way is clear from a close-up of the galaxy itself, shown on the right. As you can see, the galaxy has more than one nucleus! In this zoom, there are two foreground stars marked with an S, so you can ignore those. The other five objects are all galaxy cores, which to an astronomer is like a smoking gun: ESO 146-IG 005 has been very busy lately, eating other, smaller galaxies. Yup. It’s a cannibal. We have seen this countless times. Heck, the Milky Way is in the final stages of devouring several smaller galaxies, but in our case the process is almost complete. The nuclei of galaxies are hard to digest, so to speak: the stars are tightly bound to the core by their gravity, so it’s hard for the larger galaxy to absorb them all. It takes time. 146-IG clearly has been gulping down a lot of the other cluster members, and this is why it’s so massive. We think that most large galaxies in the Universe grew to their present size by eating other galaxies. So we know it’s massive. But how do we know how massive? Take a look at that zoom picture again. See that little arc of light to the lower left? That is a gravitational lens, an image of a distant galaxy whose light has been distorted by the gravity from 146-IG. When light passes near a massive object, its path gets bent, like a car driving on a curved, banked road. The mass of the intervening galaxy acts like a lens, hence the term, and it can have all sorts of weird effects on the light. The amount of distortion depends on lots of things, including the mass of the lensing galaxy, in this case 146-IG. There are other lensed background galaxies in the image as well, and the astronomers used those to get the mass of 146-IG. However, it’s not all that straightforward; it’s hard to separate out the mass of the galaxy from the cluster itself, and from gas and such inside the cluster that may not be part of the central galaxy. So all we get is an estimate. Worse, the astronomers used a second method to find the galaxy mass, and got a much different amount. Gas inside a cluster gets heated as it moves around and falls to the center. The amount of heating (measured by looking at the X-rays emitted by the extremely hot gas) depends on the mass of the cluster, and can be used to estimate how much stuff is there. 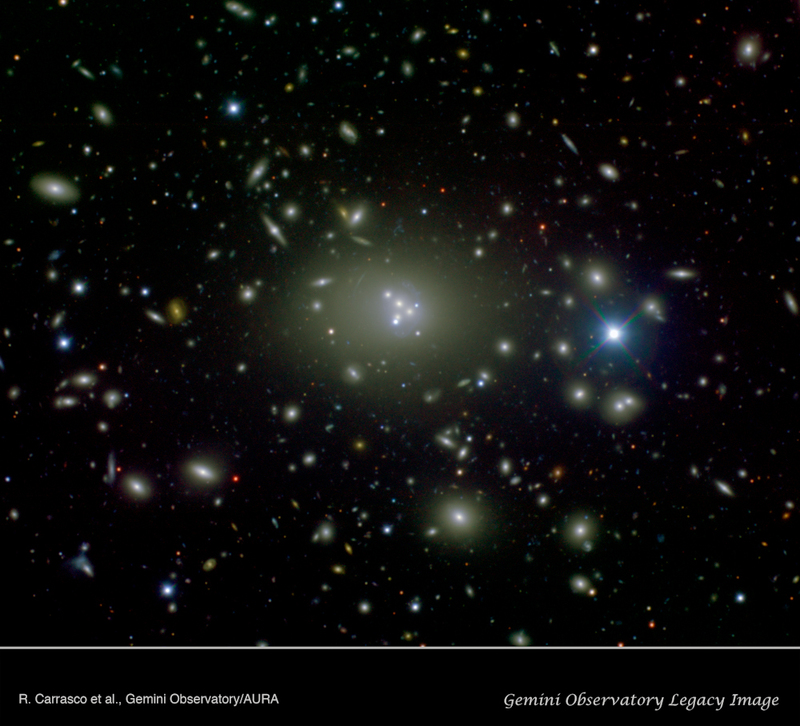 The astronomers found an "X-ray mass" only a tenth of the mass found using the gravitational lens method. There could be any number of reasons this could happen: the models for the gas assume it’s spherical and smooth when it may be neither, for example. But either way, ESO 146-IG 005 is still one of if not the most massive galaxy in the nearby cosmos. It’s much larger than our own galaxy, by a comfortable amount. In the case of our galaxy, we ran out of smaller galaxies to eat, whereas 146-IG is basically still standing in the kitchen with the refrigerator door open. It makes me glad the Milky Way is nowhere near that cluster. Sure, we got to our present size by eating other galaxies, but the time of unrestrained gluttony is in the past, and that’s good. It would make our neighborhood something less than the calm, peaceful place it is now. Having undigested galactic nuclei flying around, quadrillions of tons of gas and dust sloshing hither and yon, and all that million degree X-ray emitting gas sitting out there… that can’t be good for property values. *Note that the press release linked says the mass may be 30 trillion times the Sun’s mass. This is incorrect; that’s the total mass of the cluster core, and may include stuff that’s not part of the galaxy itself.